Walking shows sees attendees amassing a hefty pile of brochures, tear sheets and business cards at the end of each day. If you’re travelling from one country to another in covering a series of shows, this extra weight can ultimately become burdensome. 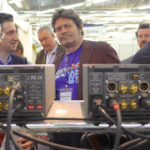 So hats off to Jonathan Derda of Peachtree Audio who lifted the email address from my business card and shot me a .pdf detailing everything I’d witnessed the previous day in their room at T.H.E Show Newport Beach. As efficient and environmentally friendly as the email follow-up is, it can’t hold a candle to the way KEF delivered the particulars of their new Reference series at the Munich Hi-end show: hi-res photos, press release doc and white paper were supplied on a USB key, itself scale model of their infamous Blade loudspeaker. Clever-cute, huh? Kent Engineering and Foundry = KEF. In the early 1970s, founder Raymond Cooke invested heavily in (then super-duper-expensive) computer hardware; a move that would enable KEF to better acquire, store and model loudspeaker measurements. This new technology subsequently informed the design process of the Model 104, KEF’s first ‘Reference’ loudspeaker. 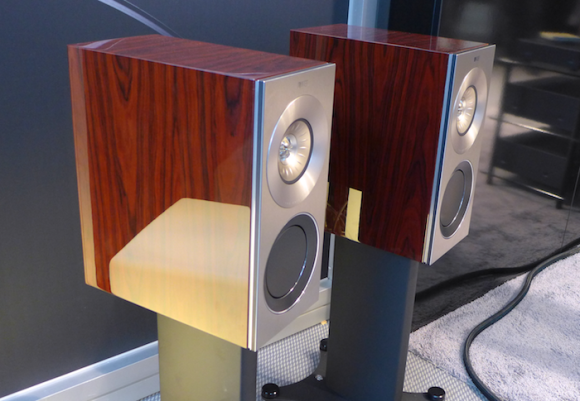 Since its 1973 debut, the Reference Series has remained at the heart of the KEF product line. That said, updates have become increasingly less common in recent years with the last Reference line refresh being 2006’s relatively minor update to the Model 207 that itself first appeared in 2001. Bringing it up to date with “new technologies and advanced materials that didn’t exist previously” KEF have announced their 2014 Reference range. Gone is the super-tweeter vibin’ coaxial extrusion. This latest update couples sleek minimalism to a hint of conservatism that’s in no way as radical an aesthetic departure as the still phenomenally successful LS50 standmount. Each loudspeaker features a Uni-Q driver that’s an iterative development of the array found in the Blade floorstander: a 25mm vented aluminium dome tweeter coaxially aligned with a 125mm midrange driver. Each model is a 3-way design with low frequency augmentation (< 350Hz) coming from a new 165mm bass driver of which there are one in the Reference 1, two in the Reference 3 and four in the Reference 5. Drivers are mounted in a super-rigid front baffle that’s a sandwich of aluminium and resin composite pressed under extreme temperatures. Ports. From The Reference white paper: “The port allows the bass to be augmented around the region that the vent is tuned and allows greater bass extension from a given size of loudspeaker.” On the rear of each Reference model, you’ll find an ovoid port with flared opening, designed as such to minimise turbulence and midrange colouration. And in a nod to the see-sawing pros and cons of sealed boxes vs. bass reflex designs, KEF have included two flexible port inserts: one short and one long, allowing the end user to tune each loudspeaker to their room and/or personal tastes. The longer liner gives a response that more closely approximates a sealed box design. 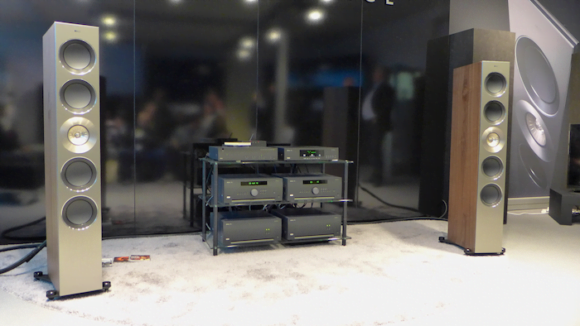 The Reference Series debuted at this year’s Munich Hi-end show where the Reference 5 floorstander handled most of the weekend’s demo duties. They were powered by a full complement of Arcam electronics. With all the ambient noise and chatter, it’s impossible to call out their abilities with refinement and subtlety but one things for sure, those big floorstanders can play LOUD. Not once did they sound light with low end heft or any hint of strain – quite a achievement given the large-ish space allocated to KEF/Arcam. Even with long port liner in place, you probably wouldn’t want to run the Reference 5 in a hotel bedroom. 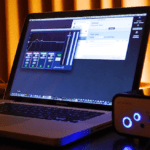 The Reference 1 standmounts would likely be a better fit for the smaller listening (bed)rooms of the Hilton hotel in Irvine but, according to ‘Marketing Samurai’ Stephanie Scola of KEF America, insurmountable logistical challenges barred their journey across the Atlantic in time for T.H.E. Show that took place two weeks after Munich. Here’s hoping then that KEF get to show off their new Reference series at the New York Audio Show in Brooklyn in late September, at which time they’re also slated to see some west coast action courtesy of San Francisco’s Audio Vision. Each model will be available in three standard wood finishes: Deep Piano Black, Luxury Gloss Rosewood and Satin American Walnut. If you’ve of need something more out there, KEF will also be producing a limited run of ‘Kent Engineering and Foundry’ special edition finishes of Blue Ice White or Copper Black Aluminium (pricing on which is TBA). Next article Blurred lines – are you sure you want it? I really dig the site – the layout, your perspective on perfectionist audio, insight on tube gear and more importantly (for me) , music in general. I’m a musician (clearly, I’m no writer) in Phoenix , Arizona, and am returning to my passion for an exquisite listening experience after almost 20 years away. I picked up a pair of KEF r300 stand-mount speakers a couple months ago. So far, they are exactly what I needed for my small listening space. Hoping to go all tube with a new amp one day. In the meantime, budget demands I use my nova125. Thanks for the words of appreciation Darren. Funnily enough, I think my next KEF investigation will be a pair of R300. Nice! Look forward to seeing that next KEF post. As you indicated, that’s what our lot turns into doing the show rounds when asked to schlep a mounting pile of paper goods with information far better shared via USB sticks. In this day’n’age of virtual music, using costly paper brochures which invariably end up in the trash is so last century, ain’t it? Kudos for shouting out for USB sticks, email dissemination or on-line press rooms with professional photography in various resolutions, white papers, specs, tech talk and the works.